Are you prepared for Tornado Season? Know what season we are entering? Are you prepared for Tornado Season? Tornado Season is generally from April to October. The peak is about mid-June. As climates shift over time from decade to decade, so does the tornado season. In the last 5 years, there have been more late-season tornados in Michigan than early season. In fact, over half of the 70 tornados in the last 5 years have been in late August, September and early October. The most common explanation for the formation of tornadoes is the result of warm, moist air meeting cooler, dry air, and creating instability in the atmosphere. When the wind changes direction and increases in speed and height, it creates an invisible horizontal spinning effect in the lower atmosphere. Inside this up-drift, rising air tilts the spinning air from horizontal to vertical, forming tornadoes that can be miles wide. Tornadoes typically form during thunderstorms, but they can also accompany tropical storms and hurricanes. These tornadoes will most often be at the right and ahead of the storm path as it comes ashore. NOAA says that the details of how a tornado dissipates are debated by scientists, but what is known is that tornadoes rely on a source of instability and a large scale property of rotation. Tornadoes can range from a few seconds to an hour long, but most last less than 10 minutes. As a tornado is weaving its destructive path, varying storm conditions can cause it to weaken and die or pick up strength and become more destructive. On rare occasions, two tornadoes can hit the ground together in the same place, but the larger tornado will typically draw in and absorb the less powerful one. The savage violence of a tornado is heart-stopping, the death and destruction it can leave behind is heart-breaking. And while the arrival of a hurricane is preceded by days of warning, tornadoes strike suddenly. Those in the path of a tornado may have 15 minutes warning if that. That makes safety precautions for tornadoes critical for survival. This year’s deadly spring drives home the necessity of preparing for tornadoes: April 2011 was a record month for tornadoes in the United States with 753 tornadoes that killed more than 360 people, according to the National Oceanic and Atmospheric Administration. That deadly month was followed by the Joplin twister, the deadliest single tornado since modern recordkeeping began in 1950. The tornado that hit Joplin, Missouri on May 23 killed more than 150 people, had winds topping 200 mph, was three-quarters of a mile wide and had a track lasting six miles. What can you do to protect your family from something like that? • If you live in an area at high-risk for tornadoes, consider building a safe room in your home. A safe room must be built to withstand high winds and flying debris. The Federal Emergency Management Agency provides free plans for building a safe room in your basement or by reinforcing a bedroom closet or bathroom. You can download safe room information and plans on FEMA’s website. • Pack an emergency preparedness kit that will meet the needs of you and your family for three days. The kit, of course, will be handy in the wake of any natural or man-made disaster. An emergency preparedness kit needs to include food and water for each member of your family for three days, a battery-powered or hand-crank radio, flashlight, spare batteries, first aid kit, can opener, local maps, moist towelettes, toilet paper, garbage bags and plastic ties for personal sanitation. Other items to consider include sleeping bags or blankets, paper towels, books, puzzles and games for children and pet food for family pets. A complete list of recommended items for an emergency kit can be found at Ready.gov, FEMA’s emergency preparedness Web site. • Buy an NOAA weather radio and keep it on your nightstand. The radio will sound a loud alert when the National Weather Service issues a tornado warning for your area. This should give you time to gather your family in the safest spot in the house. • Be alert for threatening weather. Look for the following danger signs: dark, greenish sky, large hail, a large, dark, rotating cloud, a loud roar. • Act quickly after a tornado warning. A warning means that a twister has been identified in your area. • In a public building such as a store or office, go to a designated shelter area such as a safe room, basement, storm cellar, or the lowest building level. • If there is no basement, go to the center of an interior room such as a bathroom or closet on the lowest level away from corners, windows, doors, and outside walls. • At home, go to a basement or the most interior room on the first floor. • If you’re in a mobile home, get out immediately and go to the lowest floor of a nearby building or a storm shelter. • If caught in the open, lie flat in a nearby ditch or depression and cover your head with your hands to protect yourself from flying debris. Flying debris from tornadoes causes most fatalities and injuries. 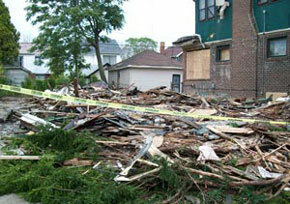 • Be alert to hazards created by tornado damage such as gas leaks, broken glass and exposed electrical wiring. • Check for injuries, but don’t try to move someone who is seriously injured unless they are in immediate danger of death or further injury.